Invite Tranquility into Your House Through Indoor Water Fountain! Have you ever thought that the decor elements you choose for your home could actually have an impact on your health and well-being? If not, then think about it! Indoor Water Fountain is a piece of décor, as beneficial as beautiful they are! Most of the people selection door fountains as a focal point in their home, but have no idea that they are actually beneficial to have around! There are a lot of different types of indoor water fountains available in the market, ranging in price from relatively affordable to extremely expensive. They are also available in a wide variety of sizes, textures,materials, color sand styles – ranging from sophisticated and rustic to the dramatic ones! Indoor fountains can be small or large, with or without additional lighting effects. Tabletop water fountains achieve serenity anywhere. This fountain is very easy to setup. They are perfect for kitchens, bedrooms, living rooms and offices. They are usually constructed using a variety of materials like copper, resin, polystone (artificial stone), fiberglass, ceramic, slate, etc. When you have no floor space for indoor fountain, Wall Mounted Fountains are a greater option. It can create a unique beautiful wall decor for your living room, foyer, office or bedroom walls. The materials such as glass, acrylic and stainless steel are more preferable. A floor fountain offers several advantages not found in the wall mount or tabletop variety; specifically, they have the ability to enchant guests with its 3D effect. They can be a great addition to foyers, offices, hallways and other living spaces. Also Read: 3D Wallpaper Décor That Add Depth to Your Tiny Room! It doesn’t matter what you are looking for, you can enjoy the following benefits when you choose to install indoor water features in your home. 01. Create a Peaceful Environment! Today’s lifestyle is exceptionally hectic. Whether you are a business owner, or an employer, or a stay-at-home parent, when you come home, you deserve to enjoy a soothing environment. The sound of falling water soothes the nerves and relieves stress.Indoor fountains are incredibly beneficial to your health as you already know the adverse effects of stress that it has on your health. Having this indoor water fountain in your home is a great way to create a peaceful, relaxing and soothing environment that helps you to calm down after a tough day! Also Read: Smart Home Solutions: Promotes Convenience & Safety to Your Health! 02. Better Sleep Awaits You! Providing these indoor water fountain in your bedroom, you will find that you have a better sleep! The calm relaxing sounds from your fountain will gently carry away the stress, allowing you to a restful sleep! 03. Create a Focal Point! Indoor fountains are visually appealing for everyone entering the house. 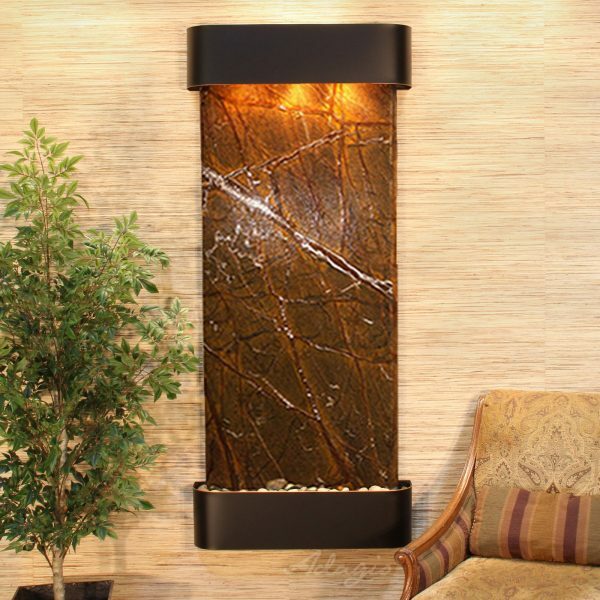 Water features usually add a unique design element to any space. If you are really planning to update your decor to the next level, adding an indoor fountain is a great option. Today’s Indoor Water Fountains are designed to be extremely noticeable and eye-catchy. You can also create your own little indoor garden by surrounding your fountain with the potted plants. If you are living in a noisy environment, the sound of running water can help to reduce unwanted noises and distractions. With an Indoor water fountain, you can help to block out these sounds, like Dogs barking outside, kids screaming, traffic, or noisy neighbors who try to distract your day. It is far more relaxing to listen to the sound of running water than to listen to these unwanted distractions. One of the most surprising benefits of the indoor water fountain is that the continuous moving water in a fountain will not only relax you with its water sounds but will also rejuvenate you with negative ions. When the water evaporates from your indoor water features, negative ions are released. These negative ions remove pollutants and allergens from the air, making it more refreshing to breathe. First let us understand, what is an ion? According to the Oxford Dictionary, it’s an atom or molecule with a net electric charge due to the loss or gain of one or more electrons. Ina simple sense, ions are invisible particles that we breathe in everyday and the charge of those particles affect our well-being. One of the most important benefits of negative ions is that they clear the air of airborne allergens such as mold spores, pollen, bacteria and viruses. Besides they also clear the air of dust, pet dander and cigarette smoke. A negative ion is an oxygen ion with an extra electron attached. They are produced through disturbances in water molecules like fast-flowing rivers and indoor fountains. When we inhale them,there is evidence that they can act as a mood booster or anti-depressant. Also Read: 10+ Tips & Tricks to Keep Your Home Germ Free! Fountains act as natural humidifiers, by adding moisture to a dry room.Indoor air is particularly dry in the winter, where there is dry air, there is the chance for dry and irritated skin and eyes. By providing Indoor fountains,you can add moisture to the air. As you know, the water evaporates;this means that the indoor water fountain or any indoor water features you purchase will constantly be adding just a slight amount of moisture to the air. An Indoor water fountain can also help your indoor plants to flourish, by adding extra humidity that is lost when heat or air conditioning units are running. These are a lot of great reasons to install an indoor water fountain in your home. Once you understand all of the benefits that they offer, you will choose to add water features to your living spaces. Having a fountain in your home can help to create a beautiful, relaxing area where you love to spend your time! Importance of Fresh Air in Your Home & Life! 15 Inspiring Mirror Decor Ideas! Next PostNext Hire Purchase – Things to Know!! !